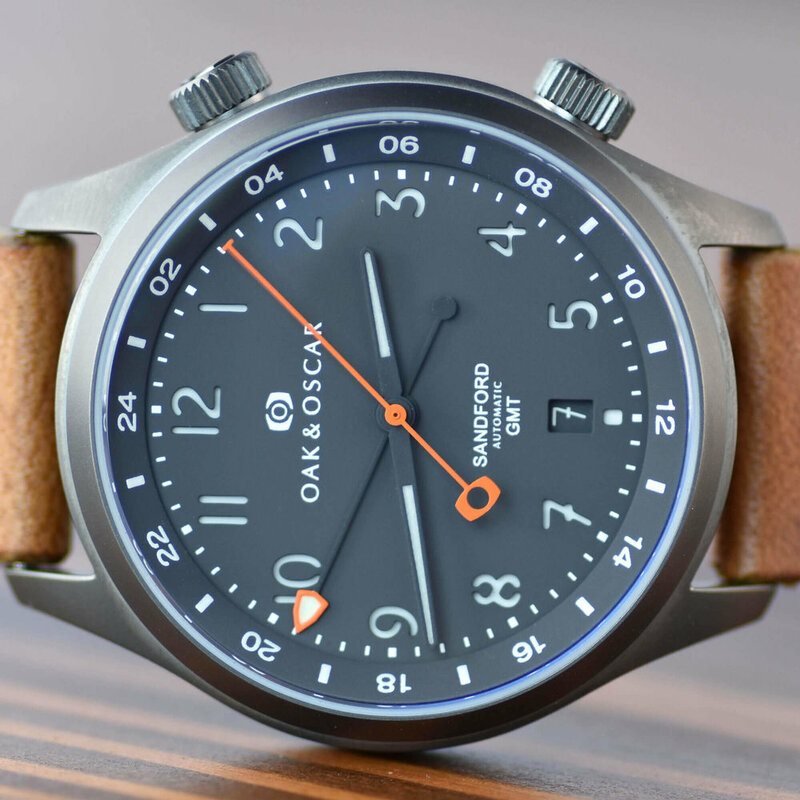 A 40mm automatic GMT with a 42 hour power reserve, sandwich dial, and an internal, rotating bezel. Named after Sandford Fleming, a Scottish-born inventor and engineer who moved to Canada in the mid-1800’s. Sandford was responsible for the development of a significant portion of the Canadian railway and was also one of the first and most influential proponents of the use of standardized time zones. Sandford was tired of the confusion caused by local and regional time discrepancies and reached his boiling point after missing a train due to a typo on the station’s timetable. The Sandford dial utilizes a similar two-layer dial construction as the Burnham but in a smaller, 40mm case. We created numerous prototypes and samples to ensure legibility while not over-crowding the dial. Tracking a second time zone, whether for travel or day dreaming, is made simple with the internal rotating bezel. 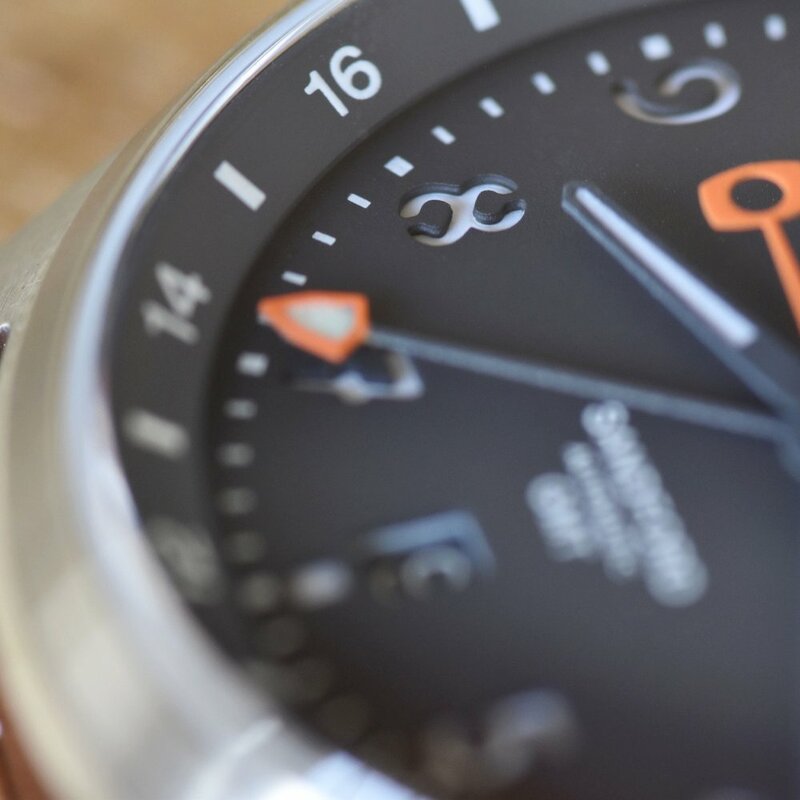 Either leave the "24" up top and independantly adjust your GMT hand or keep your GMT on local time and adjust your bezel. That easy. And if you want to get creative, you could even track a third timezone by adjusting both! Inspired by Chase's love of arrowheads and stone tools as both a kid and later in university (he actually took a class on the history of stone tools...! ), the GMT hand design mimics that of an arrowhead. The lolli-pop counter balance of the GMT hand fits inside the counter balance of the orange seconds hand perfectly as they sweep by one another. The shape is both unique and distinctive and has become an identifying design detail of the Sandford. 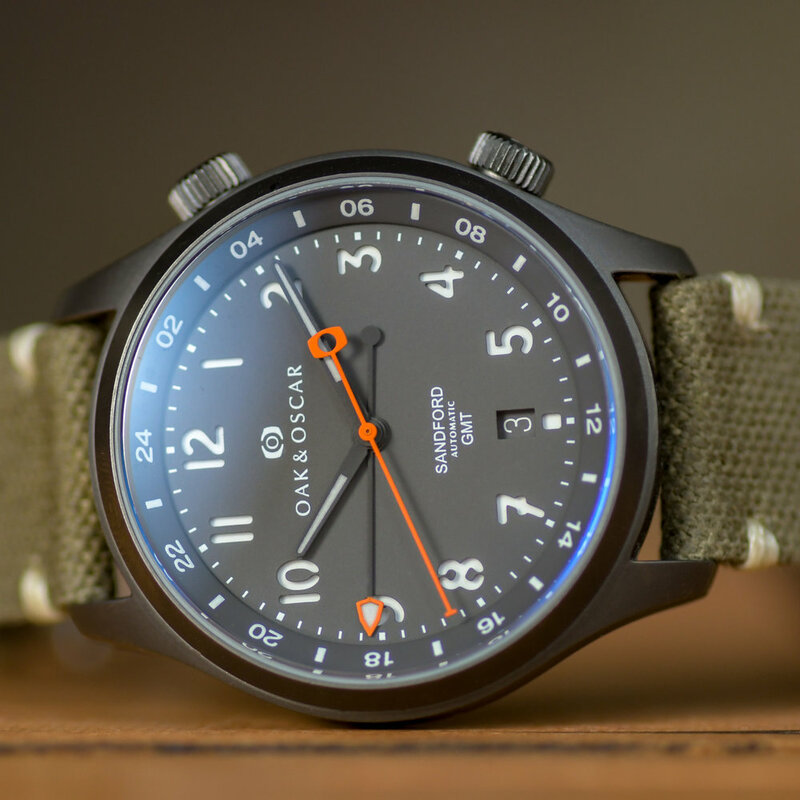 The beautifully constructed Soprod caliber C125 powers the Sandford GMT. The 25-jewel, Swiss movement has a 42 hour power reserve and a custom rotor design that helps keep your watch running strong. Soprod has been around since 1966 and has proven themselves as one of the best movement manufacturers out there. We don't like watch boxes. They're expensive, wasteful and end up in a closet. Each Sandford includes a matching leather watch wallet made by Defy Mfg Co., a local Chicago bag, apparel and accessory shop. Buttery Horween leather, the same leather used for the watch strap, protective 100% wool felt from Germany and soft grey suede pouches hold three watches and a strap tool in a compact, flat, portfolio-style case perfect for traveling and displaying one’s collection at the ever-popular watch meet-ups. But what might be most exciting about this update is the modular construction; the suede pouches are detachable for when you want to travel lighter!